In just a few years, the exposure from the sun can really cause some major damage to your garage door and leave it in a cheap looking state. At All‑Mont Garage Doors, we take care of all of our customers and ensure that their garage doors stay looking great, no matter how much exposure to the sun they might receive. Your garage door can be damaged by an accident at any time. When it is, you need to depend on a professional technician to take a look and proceed to a fast and professional garage door repair. Our staff are highly experienced, and they will work hard to ensure you are well taken care of if your garage door does encounter any issues at all. At All‑Mont Garage Doors, each member of our repair staff is highly experienced at their trade. They have years of experience in the industry, and they complete each installation with precision. They will do everything in their power to make sure your every wish is met. At All‑Mont Garage Doors, each customer is able to visit our custom‑built Design Centre. This offers customers the opportunity to preview various doors, complete it with a variety of styles, colours, and designs. Customers are even able to check out a variety of window options and accessories. There are multiple opportunities there for you to choose from. The purchase of a garage door is something the average homeowner will only do once every quarter century. The number of options available can be overwhelming, so it is helpful to be able to depend on a company that has the reputation in the industry to advise you on the best options for your home. We have every garage door style to match perfectly with your home. If you have a modern house in East Credit, it will be easy to match with one of our contemporary garage door models, if you have an historical house style as in Streetsville you might look at the Cambridge garage door model. When choosing us to help you, you will find that the process of picking out the correct garage door is made that much easier. At All‑Mont Garage Doors, we are pleased to enable our customers to pick out only the best products currently available on the market. We work hard to ensure that we only offer products that are durable and reliable. With this in mind, we sell the LiftMaster brand of garage door openers. They are simply the best product of the kind available today. These garage door openers have extremely durable motors that can be relied on year after year. These products will do the heavy lifting for you, so do not worry. Your garage door will be properly shut each and every time, and keep you safe from any extreme weather conditions that might come your way. If your garage door is staring to make some strange noises, it might be time to consider a service call. All garage doors need some maintenance from time to time, so allow the team at All‑Mont Garage Doors to take care of this for you. 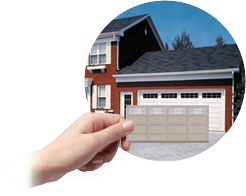 No matter what the problem with your garage door, contact us today for a quick garage door repair in Mississauga. Our quality team of professionals will work hard to fix or replace any part that needs fixing. You can trust us to keep you garage door in great working order.